Want to know about the photography equipment I take with me on my trips? To make it easier to explain, I thought I’d condense it down to one, easy-to-follow blog post, including links to these products. Click on the picture of the product to learn more information about it. Disclosure: I use Amazon a ton and am an Amazon Associate, so I do earn from qualifying purchases. I’ve started to do more underwater photography now that I own a GoPro. I didn’t actually plan on buying a GoPro, but it came in a bundle when I bought my GoPro Karma Drone (below). It’s so fun to be able to use the camera for aerial shots when I have my drone or underwater when I don’t. The GoPro Hero 5 (and 6) are both waterproof up to 33 ft without a case, so it’s perfect for snorkeling. It has WiFi capabilities, so I can quickly move pictures from my camera to my phone or laptop for editing. I seriously love this thing! I purchased my drone last year to add a different element to my photography, but I needed something simple to use that had parts that were easy to replace. I found everything I was looking for when I purchased the GoPro Karma Drone. It comes with a backpack carrying case, a gimbal to use without the drone, the controller, and the drone itself. Right out of the box, I was able to take it for a flight, and that’s amazing since I don’t even play video games! Every single part of the drone has replacement parts available, so if you crash it, which I have done a few times, there’s no need to panic. I was able to swap parts out pretty quickly. The only thing that can’t be fixed is drowning the drone. It is not waterproof like the GoPro Hero 6. My gimbal (also known as the Karma Grip) was part of a package when I purchased my drone, but it can be bought separately. I use it quite often when I’m doing videos, as the gimbal stabilizes the GoPro. The result is an excellent, smooth quality instead of jumping around as a video camera would if you were walking around with it. It took me the longest time to find the ideal camera bag that worked for me. I tried the backpack style, but I usually only had it hanging from one shoulder. Then I tried one that was styled more like a purse, to disguise my camera, but it was heavy and clunky to use. Then I found the one I am currently using, and I still really love it! It holds the perfect amount of equipment – camera body, two lenses, my GoPro Hero 6 and my gimbal. The clasps make it harder for pickpockets to get into your bag and the top just zips open, so I can easily access my equipment. It’s super light and can be worn crossbody. I seriously love my bag. a heavy camera after you add a decent lens to it. Last year I decided to try out a new set up and have purchased a Fujifilm XT2 Mirrorless Camera. Because it is mirrorless, it is substantially lighter than a regular DSLR, even with a lens attached. I’m finding the quality of my pictures to be just as good as my Canon without the weight. It did take some getting used to, as I learned to shoot on a Canon. But every time I shoot with it, I learn something new that I can do with it. I have two lenses that I primarily shoot with – an 18-55mm and a 35mm. The 35mm lens is on my camera most of the time, for those close shots. The 18-55mm lens is brought out when I’m trying to get a great landscape shot or take advantage of its great zoom capabilities. 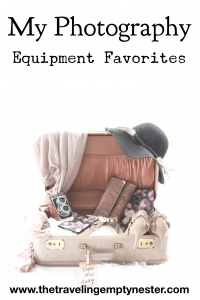 So there it is – my photography equipment list, which has been tested and tried many times during my travels. I don’t travel with all of it on every trip, as drones aren’t allowed in some parts of the world. Please let me know if you have any questions about the equipment I use. I would love to hear what others like to use on their trips to document their travels!